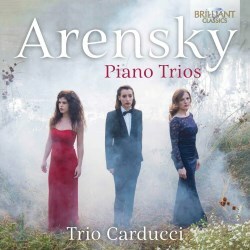 Brilliant Classics has released an album of Anton Arensky’s two piano trios played by Trio Carducci. A most underrated composer, Arensky wrote a relatively small body of eight chamber works of high quality and deserves a wider circulation in the recital hall. On the other hand, the trios have done well in the catalogue with a number of recordings available especially of the Piano Trio No. 1. From 1894, the same year as Arensky’s one act opera Raphael, his Piano Trio No. 1 is dedicated to the memory of Karl Davidoff director of the St. Petersburg Conservatoire during his time there as a student. Davidoff was a renowned cellist and predictably Arensky ensures the score contains a prominent cello part. Undoubtedly my favourite Arensky chamber music score, I especially relish the playing of the opening movement Allegro moderato with its melting lyricism and also the insatiable spirit of the Scherzo, a sparkling waltz. A late work, Piano Trio No. 2 was written in 1905, the year before Arensky’s death. Composed during a period of continuing illness the work might be considered as the composer’s swansong. In the same year Arensky also completed his set of Etudes for piano and The Tempest, incidental music to Shakespeare’s play. Following Piano Trio No. 1 by nine years, what is noticeable here is the maturity and substantial progression in Arensky’s composing style. Sadly, the engineering team provides sound that is to my ears uncomfortably closely recorded, robbing the instruments of tone colour with bone-dry sound but it’s mainly the rasping distortion of the louder passages that results in a difficult listen. Worst of all is when listening through headphones with the piercing sound often excruciating. Only in the slow movements of each work is the sound just about bearable. Of course, tolerance levels differ from one individual to another, but I am unable to concentrate sufficiently on the performance through the worst of the sound. For Arensky recordings that contain both Piano Trios I direct readers to the outstanding 2013 accounts from Leonore Piano Trio on Hyperion. Well worth hearing too is the captivating 2012 Berlin account of Arensky’s masterpiece the Piano Trio No. 1 played by Trio Wanderer on Harmonia Mundi c/w Tchaikovsky Piano Trio. Impressively played by Spectrum Concerts Berlin another excellent recording of the Piano Trio No. 1 is contained on its all-Arensky chamber music album coupled with the Piano Quintet and String Quartet No. 2 recorded live in 2014 at Kammermusiksaal, Philharmonie, Berlin on Naxos.